Today marks the 196th anniversary of Izannah Walker’s birth. She was born in Bristol, Rhode Island on the 25th day of September in 1817. You may read more details about Izannah’s life in this post. I wish I could invite you all over to my house for cake and silly party games, but since I can’t, I’m doing the next best thing and having a SALE to celebrate the occasion and to say thank you for being such wonderful customers, students and friends. 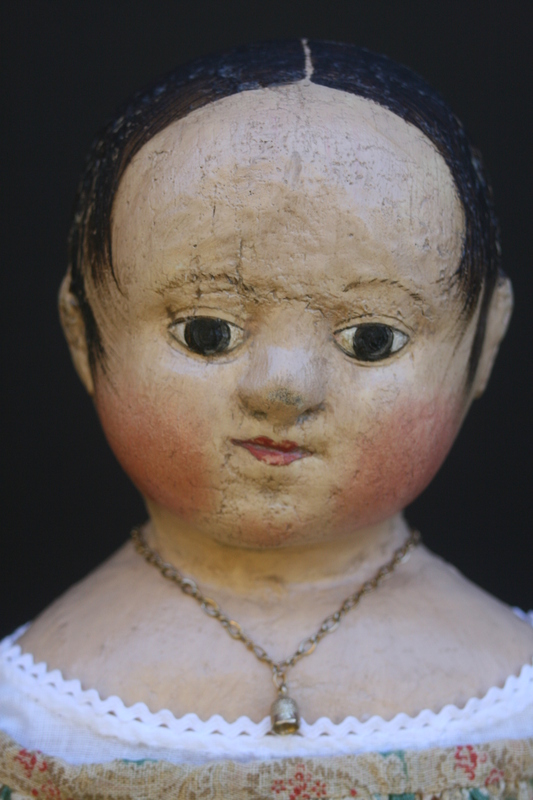 It is such a great pleasure to know other people who love Izannah’s dolls as much as I do! 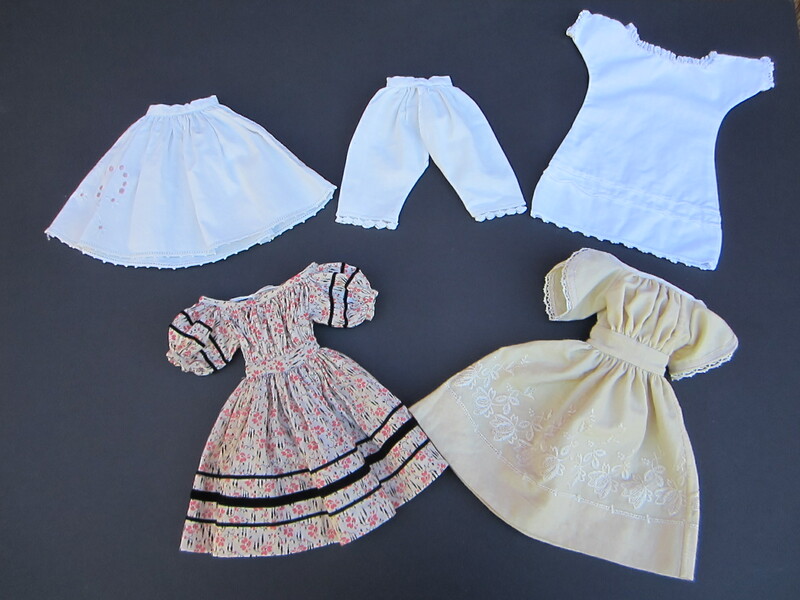 From 9/25/13 – 9/29/13 all of my reproduction Izannah Walker dolls, additional custom made dresses and accessories for your Izzy, Izannah Walker doll clothes patterns and Izannah Walker Doll Making Classes are 10% off. This sale applies only to items ordered from September 25th through September 29th, 2013, the discount is not available on prior orders. As always, all items may be placed on lay-away with terms to fit your budget and shipping is free to any United States address. I generally just have two sales per year, my Izannah Walker Birthday Sale and my Christmas Sale 🙂 So don’t let this one pass you by. 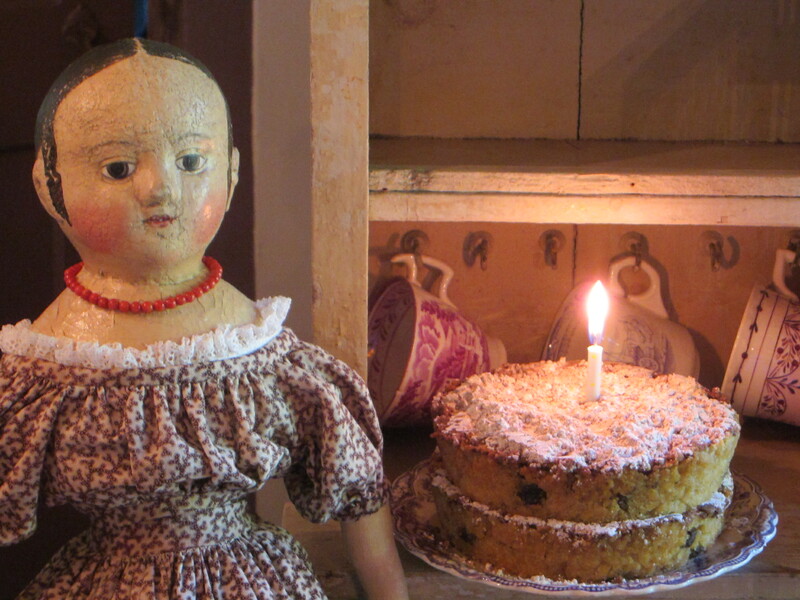 I have three very special dolls available for this years Birthday Sale. One of them is created from a brand new mold that I made from my friend Mary’s Izannah Walker doll, Anna. Thank you Mary!!! 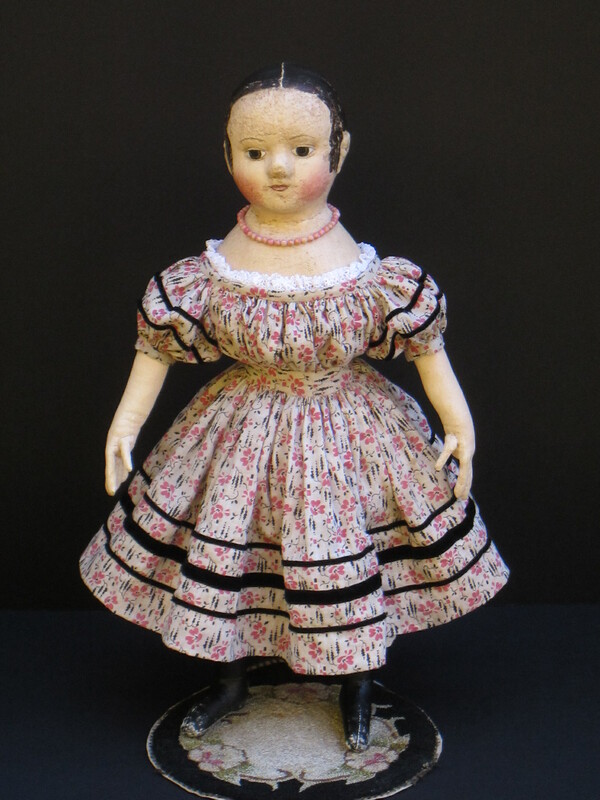 Anna is 17 inches tall, so she is a smaller size than my other dolls and has the look of a younger, chubbier child. 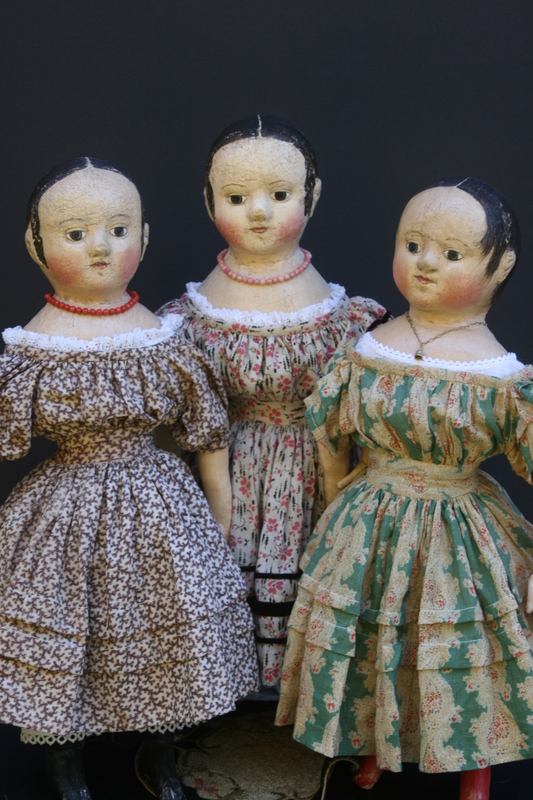 All three of these dolls have very aged appearances, befitting young ladies that were made early in Izannah’s doll making career. They each come with two elaborate dresses, full of wonderful little details to delight the heart of any dress maker, a chemise, pantalettes, petticoat and necklace. 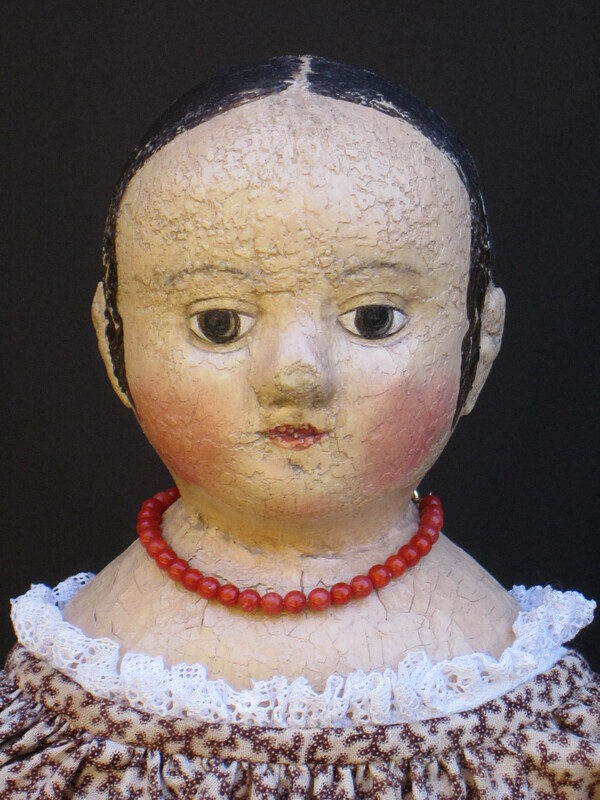 Isabeau #1 SOLD – Thank you so much for stopping by to look at her! 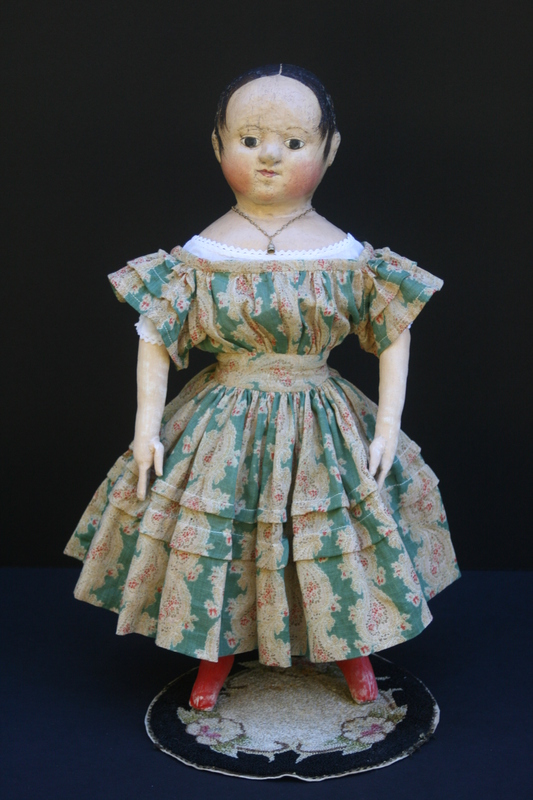 Please contact me if you would like to order a custom made doll similar to this one. SOLD Isabeau #1 comes with a necklace made from hand strung pale pink bone beads. SOLD Her dress, made from antique pink and black print fabric is adorned with rows and rows of black velvet ribbon. SOLD Isabeau #1 wearing her winter white antique wool dress. I made this dress from an antique unfinished, so never worn, wool baby’s petticoat. 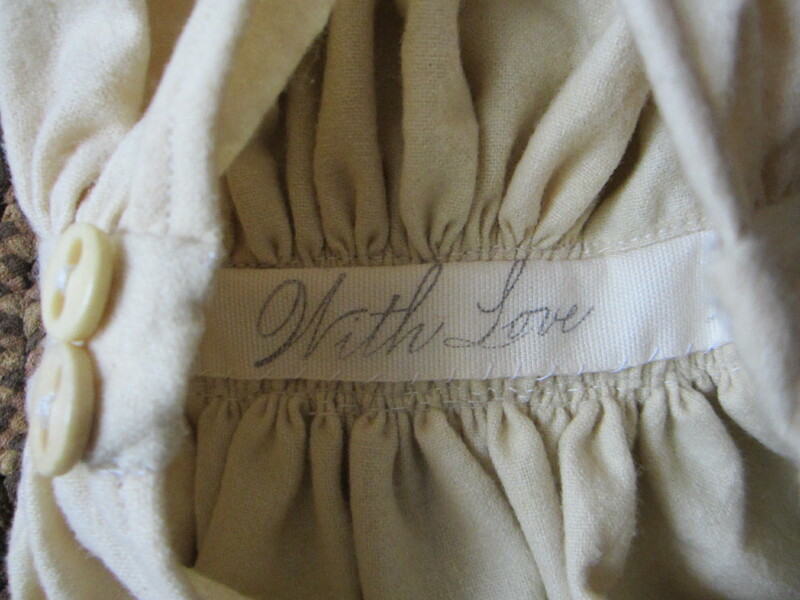 A surprise sentiment hides inside the waist band of her dress, which fastens with hand carved bone buttons. 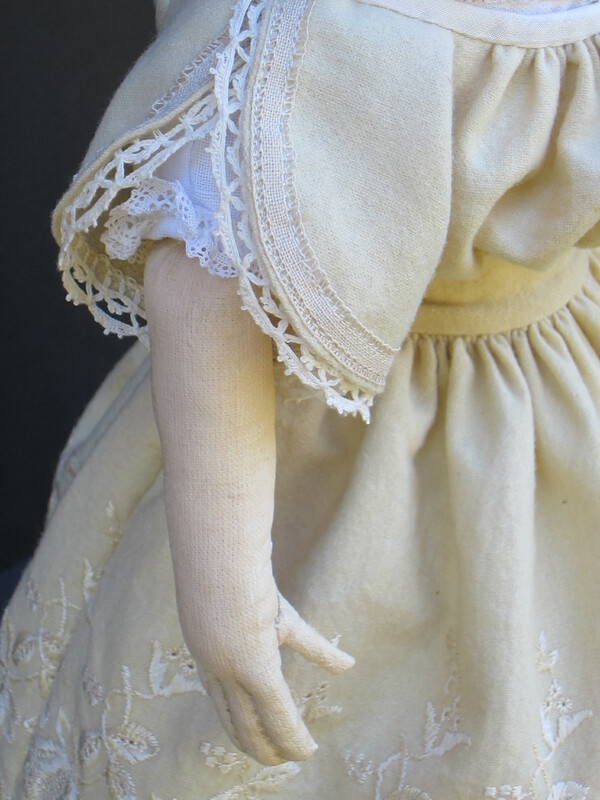 Details showing the antique trims used on the sleeves of Isabeau’s embroidered wool dress. Isabeau #2 – SOLD Thank you! SOLD Isabeau #2 shows off her hand strung real coral beads. 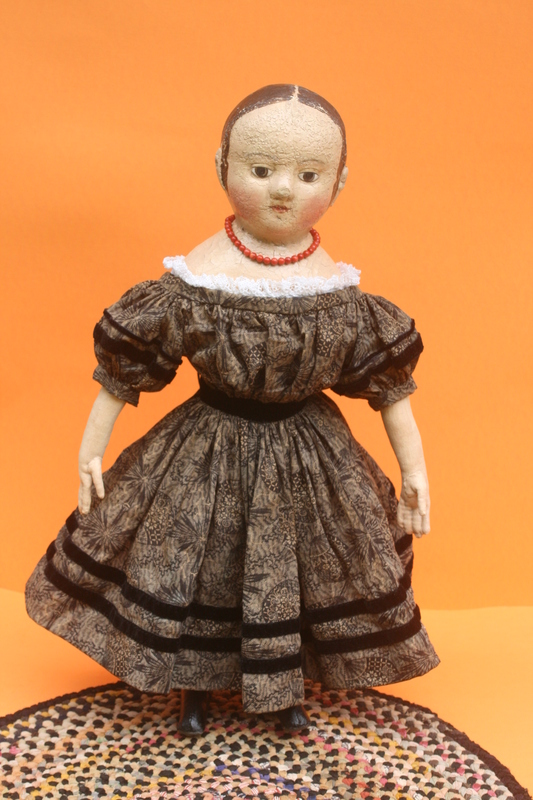 SOLD Isabeau #2 is wearing a dress that I made for her from a mid-1800’s brown “coral” pattern print fabric. The dress has full gathered sleeves, two growth tucks in the skirt and a deep 3 inch hem. SOLD Isabeau #2 in her black party frock. The dress fabric dates to the late 1800’s. Rows of antique black velvet ribbon encircle the sleeves, waist and hem of the dress. Anna #2 – NOW SOLD THANK YOU SO MUCH FOR LOOKING. Even though this one is sold you may order a custom made Anna style doll, and if you love these dresses I have enough fabric to make another set just like them. SOLD Anna#2 wears a tiny golden thimble on a chain around her neck. 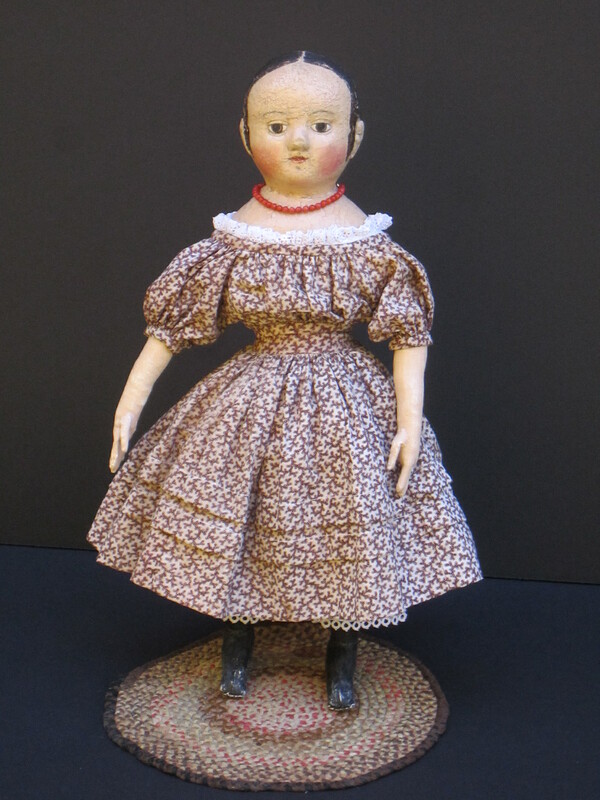 SOLD Anna #2 is shown here wearing her dress made from a very early c. 1830-1840 cotton gauze paisley print. The green, red, brown and ivory fabric is perfect for late fall and the upcoming Christmas season. The sleeves and skirt of the dress have graduated growth tucks. SOLD Anna’s black dress is made from another very early cotton print fabric. The neckline of the dress is trimmed with antique ivory cotton ribbon, plus a row of antique silk velvet ribbon. Her chemise is trimmed in tiny waved braid (aka rick rack in modern terms). 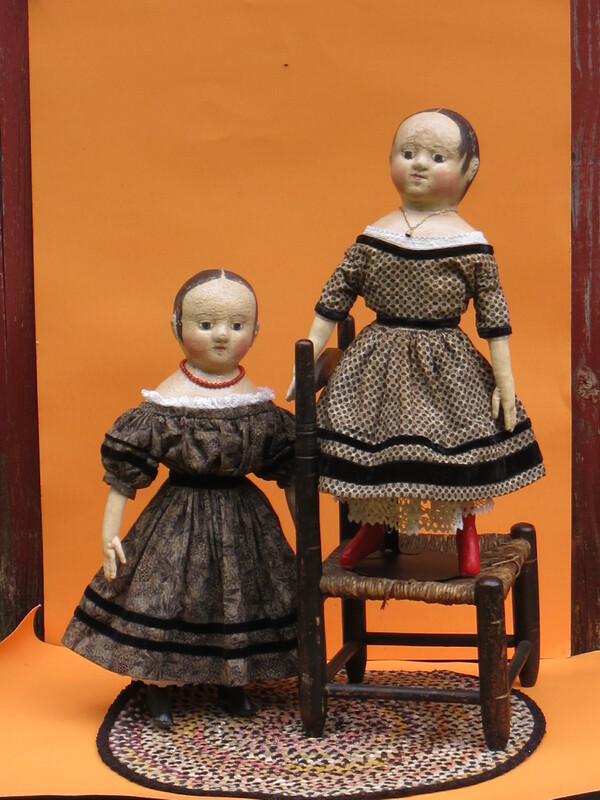 Isabeau #2 & SOLD Anna #2 show off a little Black Magic for All Hallows Eve. Black dresses are one of my favorites year around because they are a neutral accent in any room and the dark color will draw your eye to the doll and make her painted features “pop” and glow. Are you wondering where Anna #1 is? In the very near future she is going to be living with Mary, her older sister Anna and all of her Walker cousins in Vermont. 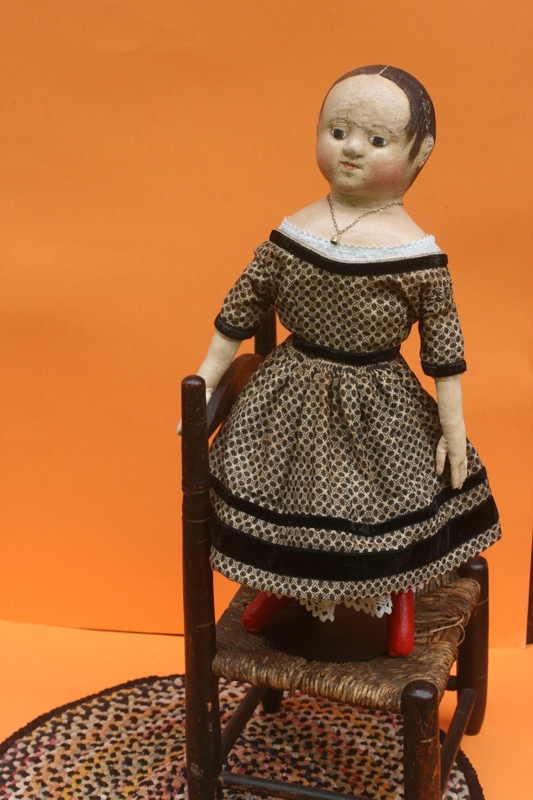 Members of my Izannah Walker Doll Making Class may read about my adventures in making Anna #1 in a continuing series of posts on the class member site. I am a much better doll maker than I am a photographer. All of the girls look so much nicer in person. If you would like to see more photos of any of the dolls before placing an order, just ask. 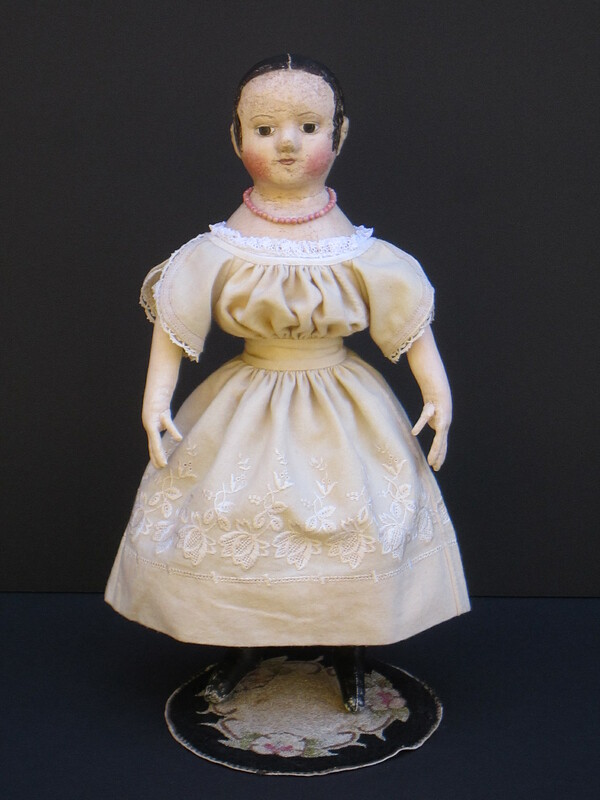 To purchase any of these dolls please visit my website ASweetRemembrance.com or alternately you may email paula@asweetremembrance.com or call 860-355-5709. 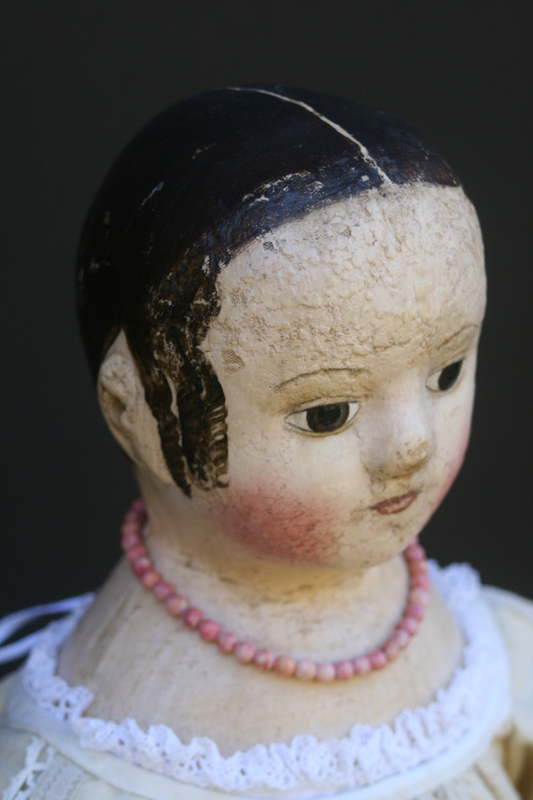 Time worn, well loved dolls are the ones that kindle the fiercest love in my heart, but I know that some of you dearly love newer, more pristine dolls. 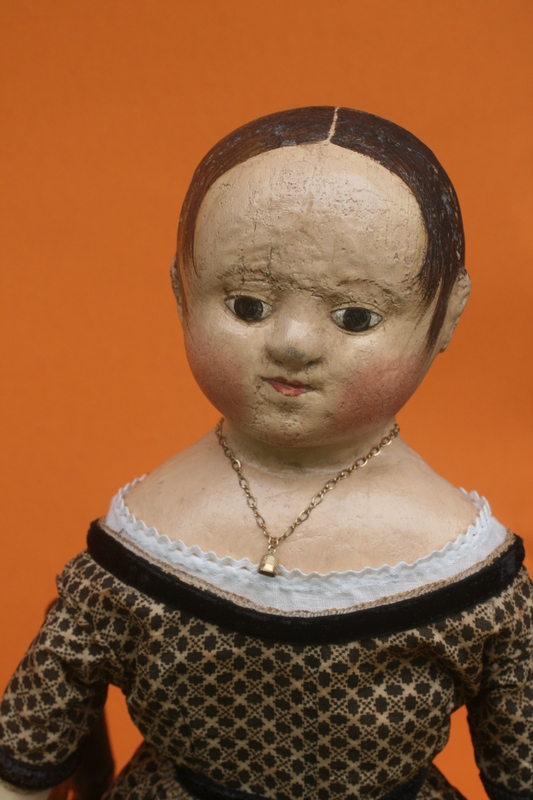 Don’t despair, I would be happy to make you the Izannah Walker doll that inhabits your dreams and has captured a place in your heart. Call or email me to place a custom order, 860-355-5709 ( 9:00 a.m. – 9:00 p.m. Eastern Time) or paula@asweetremembrance.com. I do have a bit of a waiting list for custom work, so the sooner you order the better. 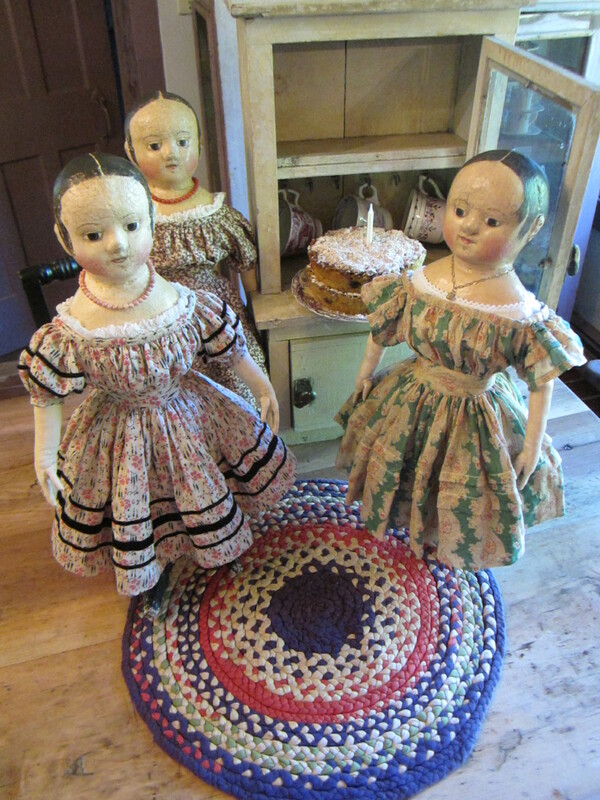 Click here for a quick guide about my three different styles of dolls. 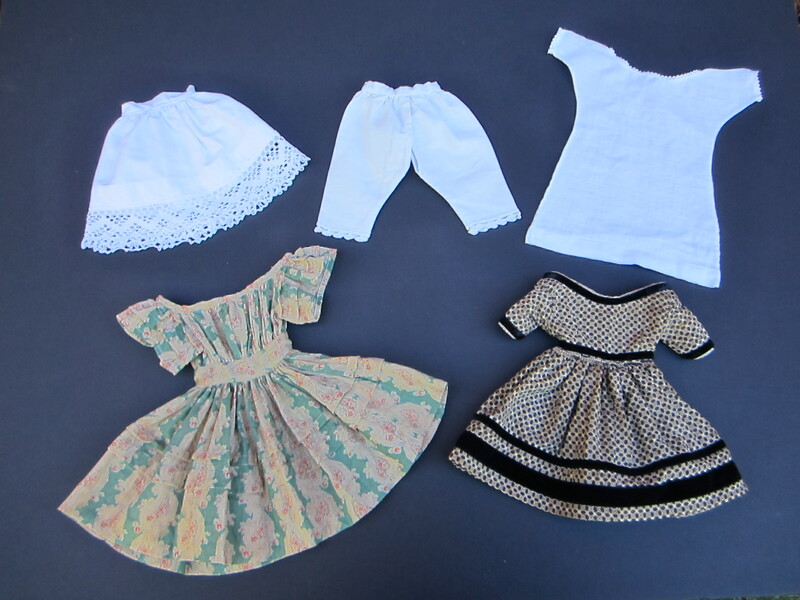 Email (paula@asweetremembrance.com) or call me (860-355-5709) about prices and available fabrics for custom made doll clothing and accessories. 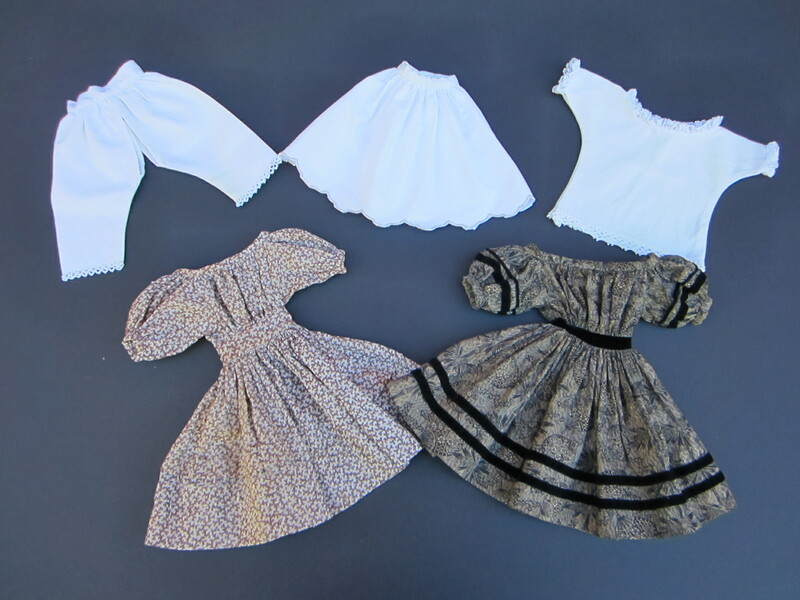 Simple dresses made from antique fabric start at $200 apiece. More elaborate dresses with a greater number of tucks, fuller skirts, rows of ribbon or lace trim, embroidery or more costly antique fabrics run from $250 -$275 and may go upwards. Handmade leather shoes are $75. Any custom order is 10% off during the sale. Scroll up to see the new style of dress that I made for Anna #2. The fully lined dress has a slim cut bodice and sleeves, with a cartridge pleated skirt and velvet ribbon trim. The cost of an identical dress is $295, if the dress must be fully lined, or $275 for one with a lined bodice. If you would like to order a pattern for a full set of clothes to fit one of my 18- 1/2 inch Izannah Walker dolls click on this link. I don’t have a pattern available yet for smaller size clothing to fit Anna. To read more about my Izannah Walker Doll Making Class by Mail follow this link to my website, where you may also order the class. The class comes with unlimited support, plus a class member only discussion site that features extra bonus material and patterns, including five different flat faced heads that work with the rest of your Izannah class patterns so that you can create a variety of different cloth dolls as friends for your Izzys! Sophie and Mae, two of my dolls that I made using the flat faced patterns will be featured in the Spring 2014 issue of Prims magazine. After trying on all their new clothes and posing for their photo shoot, the girls and I spent some time in the kitchen baking Izannah a birthday cake. 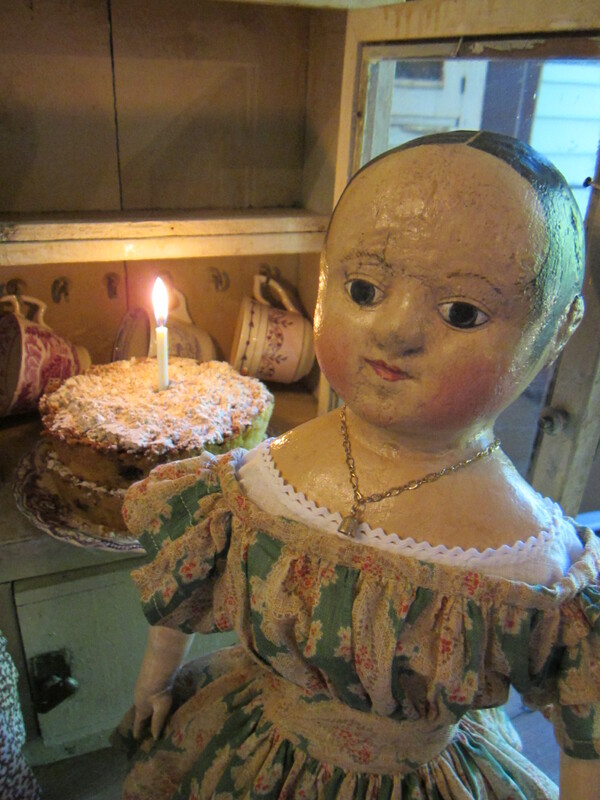 We all agreed that it was the perfect treat to celebrate the birthday of our very favorite doll maker! 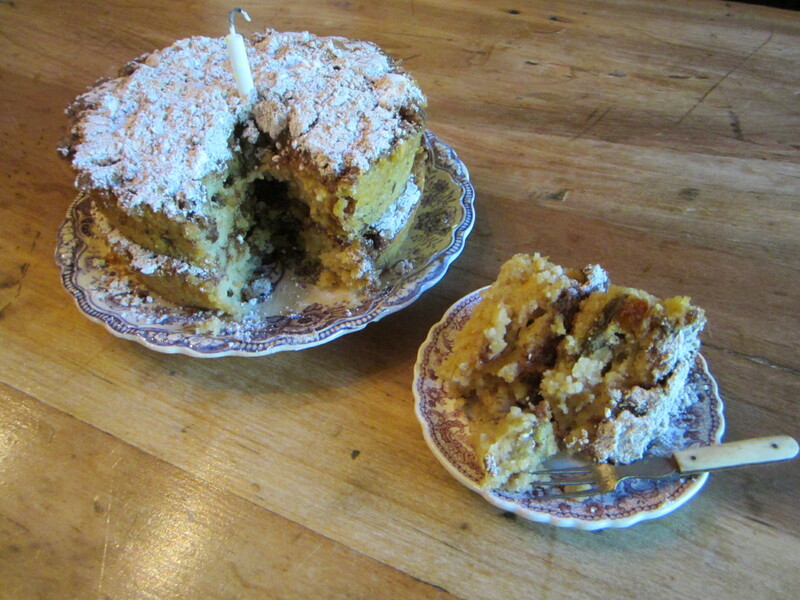 The recipe for the cake came from The Best of Shaker Cooking by Amy Bess Miller and Persis Fuller. 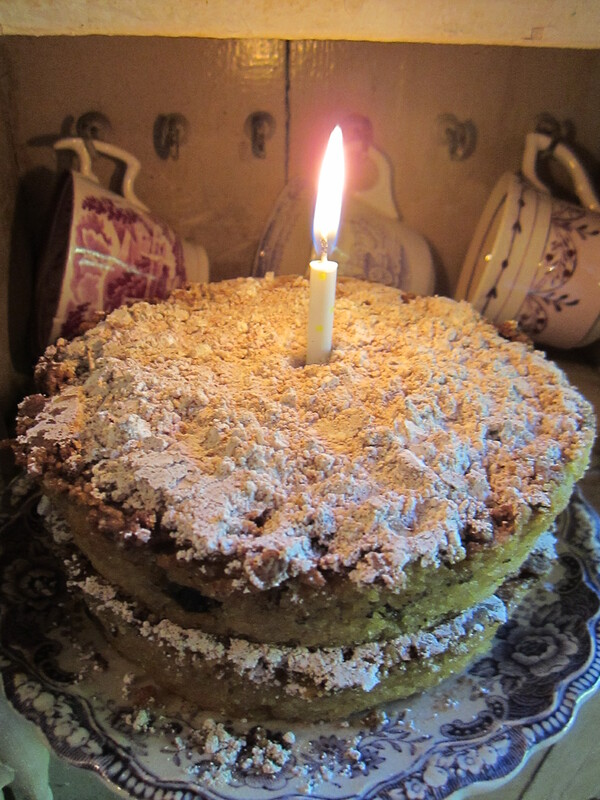 I chose this recipe because it is one that would have been in use during Izannah’s lifetime and is filled with apples, the perfect seasonal fruit for an autumn birthday. 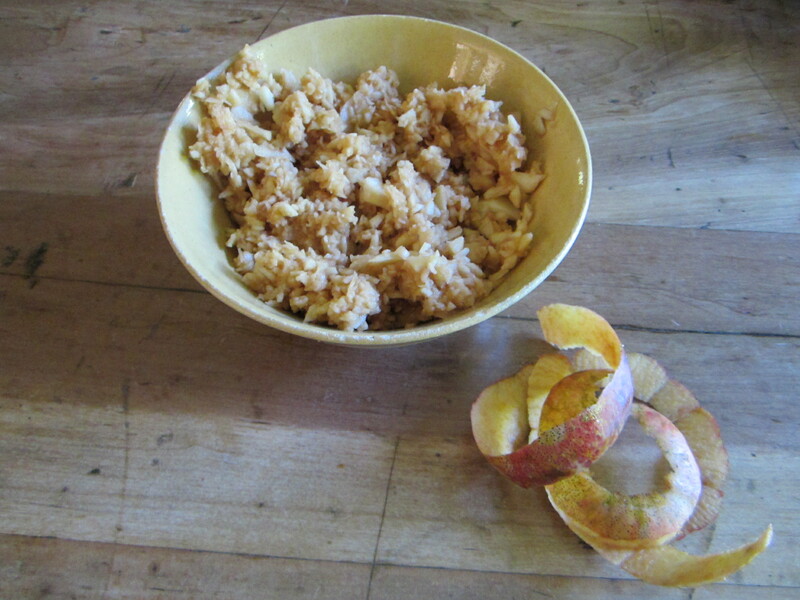 I picked apples to use from our oldest apple tree. 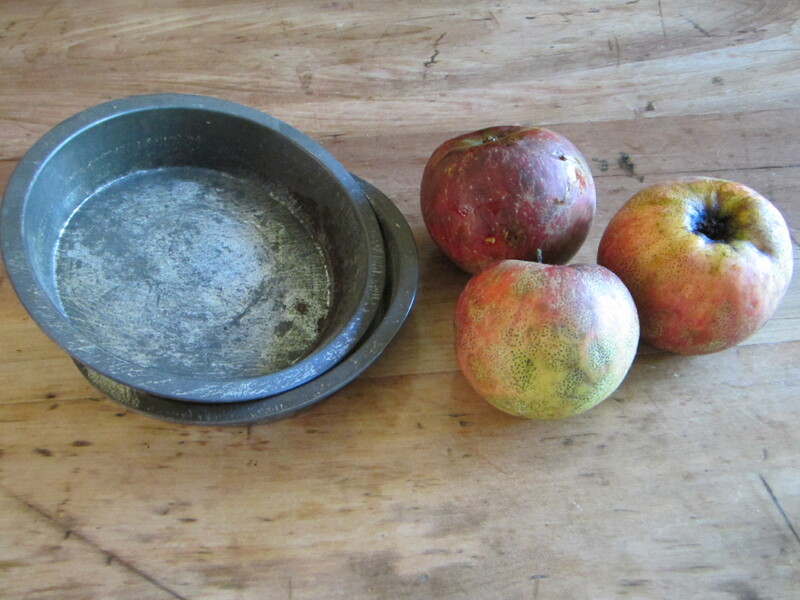 It is a very firm, late season cooking apple that I have never been able to positively identify. We grow our apples organically, so they are not picture perfect, but I’m sure apples just like these would have been a familiar site to Izannah. Cream butter and gradually add 1/2 of the sugar, beating well. Beat egg with remaining sugar, add to first mixture. 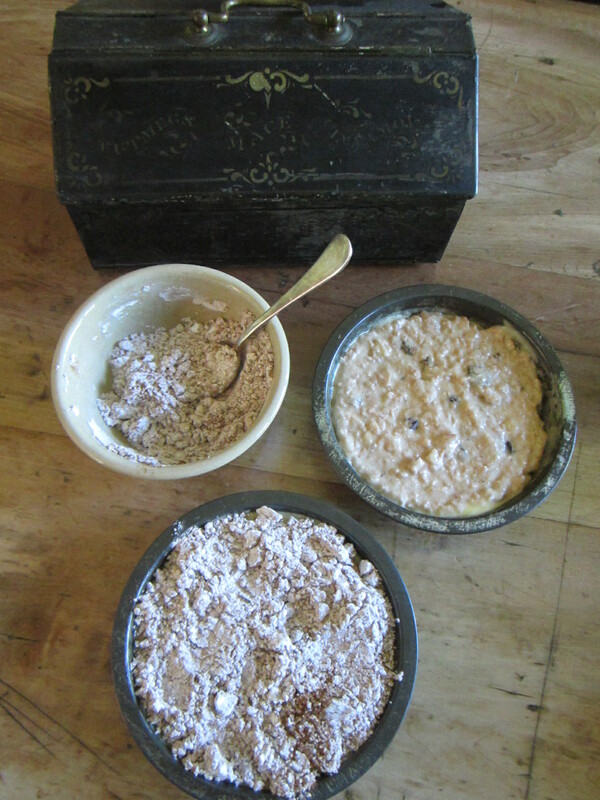 Sift in flour, salt and baking powder alternately with the m ilk. Flavor with vanilla. Add apples and currants or raisins. 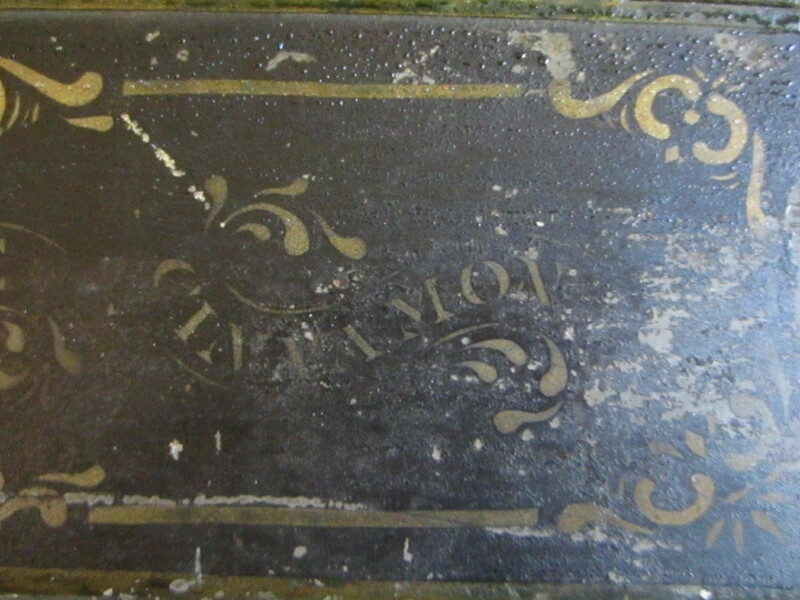 Beat well to mix and turn into a well-buttered 9 inch cake tin, square or round. Sprinkle with powdered sugar and cinnamon, and bake in a moderate oven (350 degrees) for 30 minutes. Makes 1 cake. I love them all and such a dear birthday celebration!